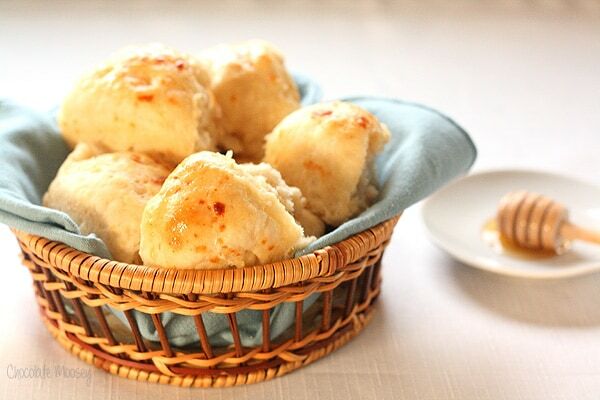 These fluffy, warm dinner rolls made from scratch with honey butter brushed on top are the perfect accompaniment to nice home-cooked family dinner. I love baking bread but certainly don’t do it often enough. Even though it’s summer, I still love to bake fresh bread. When you create a nice summer meal with produce you bought at the local farmer’s market, chances are you’ll need some bread to accompany it. 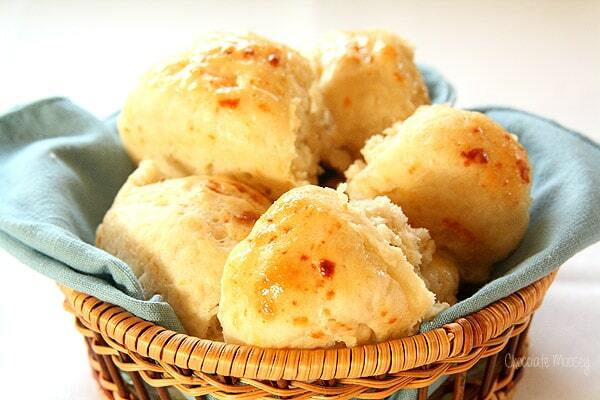 How about some Honey Butter Dinner Rolls? It only takes a few minutes to make the dough. Then while it is resting, you can finish prepping the rest of dinner. I’ve made these dinner rolls several times before, once for Thanksgiving (or was it Christmas?) and again just last weekend to go along with some Italian wedding soup. 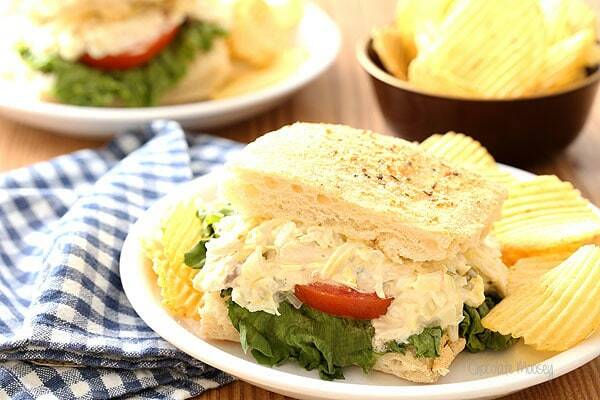 At first glance, this recipe may seem time-consuming, but most of it is resting and rising time. While you are waiting, you can finish prepping dinner. They only take a little over 10 minutes to bake, so you can pop them in the oven when dinner is almost ready. Fresh and simple indeed. This recipe involves yeast, but don’t be scared! This is a low-key recipe for those who are new to baking with yeast. It is important you measure your water temperature. Too cold means the yeast won’t activate. Too hot and the yeast will die. There is a little bit of kneading involved, but I find that very relaxing. Then you break the yeast into balls and place them into a round cake pan. This gives the dinner rolls a bit of a rustic look after you break them apart. Then you brush these fluffy dinner rolls with a honey butter glaze. Prep time includes resting time for the dough. You can let the dough rest and rise while you prepare the rest of your dinner. In a large mixing bowl, whisk together 1 1/2 cups flour, sugar, salt, yeast, garlic powder, and onion powder. Add warm water and melted butter. Beat for 3 minutes or until smooth. Turn off the mixer. 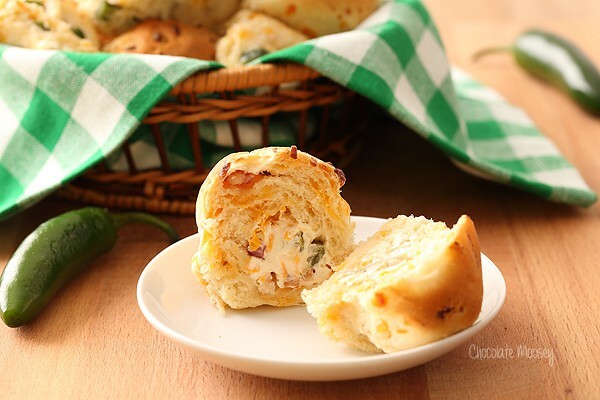 With a spoon, stir in the cheese and enough remaining flour to form a soft dough (1/2 - 1 cup). On lightly floured surface, knead the dough for 4-6 minutes (you may need to add a little bit more flour if the dough is still sticky, but don't add too much). Cover and rest for 10 minutes. Lightly grease an 8 or 9 inch round pan with cooking spray. Divide the dough into 12 pieces, shape into balls, and place in the pan. Cover and let rise in a warm place until doubled, 30 minutes. During the 30 minute rest, preheat the oven to 375F. When ready, bake the rolls 11-14 minutes or until lightly browned. While the rolls are baking, make the honey butter: In a small bowl, combine the butter, honey, garlic powder, and onion powder. Brush over the warm rolls and sprinkle with some sea salt. Let cool until the glaze sets then serve warm. 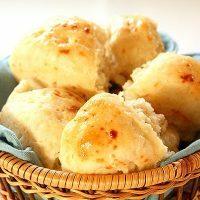 What a great recipe for quick yeast rolls! Thank you so much for sharing this one. I love the idea of making your own instead of buying rolls. I am calling you out! Here and now! Your photos ARE frickin amazing!!! Just saying. You are making me wish I didn’t have to watch my carbs! Love your logo, btw. I love this post and this recipe…. this may be my all time favorite…. You are amazing! 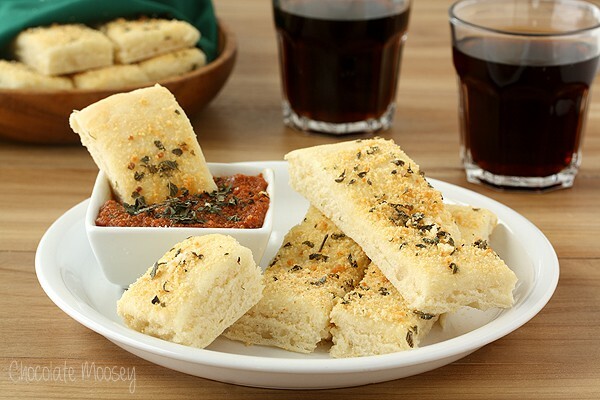 I would love to try this butter plain with crusty bread to get the full flavor. Otherwise, I’d use it in a butter sauce over steamed veggies. These little gems would make great sliders! These sound amazing! Sweet and savory, yeasty bites of goodness, can’t wait to try them! The rolls look amazing! I would love to win! I would use the butter on the bread that I just learned to make! 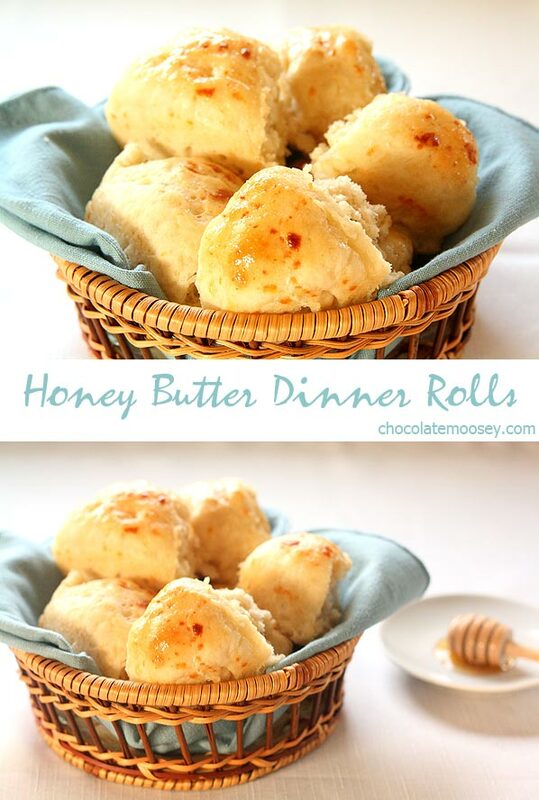 Honey butter rolls sound amazing-I eat something like this at the Texas Roadhouse and love it! I’d love to use this butter to make these rolls! My favorite recipe made with butter is one I just made up yesterday: Summer Shrimp Pasta! :) It’s on my blog at http://thewateringmouth.com/summer-shrimp-pasta/ Thanks for letting me enter! Cook the pasta according to directions in salted water with a few glugs of olive oil to keep it from sticking. You can use whatever type of pasta you prefer. I liked the colors together of the basil linguine and fettuccine together. Once cooked, set aside. Add 1 tbsp butter and 1 tbsp olive oil to a small saucepan. Snap the corn in half and place in pan over medium to medium-high heat. Spin the corn in the pan to coat with the butter and oil. Saute the corn for 15-20 minutes, spinning occasionally to slightly brown the corn evenly. Remove from heat and let cool to the touch. Boil the shrimp in a pot of water (salted and oiled just like the pasta water) for 3 minutes or until just opaque. Drain and set aside. Slice the tomatoes into bite-size pieces. Chop the basil into shreds or small pieces. Slice the corn off the cob. In a large saucepan or the pot you used to cook the pasta and shrimp, over medium heat, combine all ingredients, plus 1 tbsp butter, 1 tbsp olive oil and salt to taste. Toss until combined and warm. These look so delish!! Your pics make me want to eat my laptop!! :) Thanks for sharing for #SundaySupper! These look soooo good! I would love to try this butter on these rolls. I found this on Foodgawker. The pics are beautiful. I can’t wait to make these! They look so perfect!! My favorite recipe with butter is without a doubt banana bread!! I’ll never get tired of a slice of banana bread with warm butter on top. Yum!